This API does not guarantee that timers will fire exactly on schedule. Delays due to CPU load, other tasks, etc, are to be expected. The WindowTimers interface adds to the Window interface and the WorkerUtils interface (part of Web Workers). Each object that implements the WindowTimers interface has a list of active timeouts and a list of active intervals. Each entry in these lists is identified by a number, which must be unique within its list for the lifetime of the object that implements the WindowTimers interface. Let handle be a user-agent-defined integer that is greater than zero that will identify the timeout to be set by this call. Add an entry to the list of active timeouts for handle. Get the timed task handle in the list of active timeouts, and let task be the result. Get the timeout, and let timeout be the result. Wait until any invocations of this algorithm started before this one whose timeout is equal to or less than this one's have completed. Let handle be a user-agent-defined integer that is greater than zero that will identify the interval to be set by this call. Add an entry to the list of active intervals for handle. Get the timed task handle in the list of active intervals, and let task be the result. If timeout is less than 10, then increase timeout to 10. If the method context is a Window object, let global object be the method context, let browsing context be the browsing context with which global object is associated, let character encoding be the character encoding of the Document associated with global object (this is a reference, not a copy), and let base URL be the base URL of the Document associated with global object (this is a reference, not a copy). Otherwise, if the method context is a WorkerUtils object, let global object, browsing context, document, character encoding, and base URL be the script's global object, script's browsing context, script's document, script's URL character encoding, and script's base URL (respectively) of the script that the run a worker algorithm created when it created the method context. Return a task that checks if the entry for handle in list has been cleared, and if it has not, creates a script using script source as the script source, scripting language as the scripting language, global object as the global object, browsing context as the browsing context, document as the document, character encoding as the URL character encoding, and base URL as the base URL. If timeout is an Infinity value, a Not-a-Number (NaN) value, or negative, let timeout be zero. Round timeout down to the nearest integer, and let timeout be the result. The registerProtocolHandler() method allows Web sites to register themselves as possible handlers for particular schemes. For example, an online telephone messaging service could register itself as a handler of the sms: scheme ([RFC5724]), so that if the user clicks on such a link, he is given the opportunity to use that Web site. 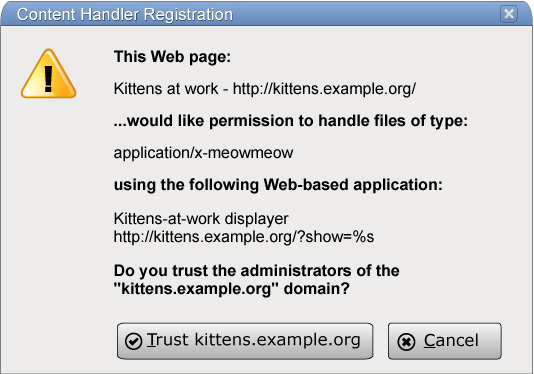 Analogously, the registerContentHandler() method allows Web sites to register themselves as possible handlers for content in a particular MIME type. For example, the same online telephone messaging service could register itself as a handler for text/directory files ([RFC2425]), so that if the user has no native application capable of handling vCards ([RFC2426]), his Web browser can instead suggest he use that site to view contact information stored on vCards that he opens. A scheme, such as ftp or sms. The scheme must be compared in an ASCII case-insensitive manner by user agents for the purposes of comparing with the scheme part of URLs that they consider against the list of registered handlers. The scheme value, if it contains a colon (as in "ftp:"), will never match anything, since schemes don't contain colons. This feature is not intended to be used with non-standard protocols. When the user agent uses this URL, it must replace the first occurrence of the exact literal string "%s" with an escaped version of the absolute URL of the content in question (as defined below), then resolve the resulting URL, relative to the base URL of the entry script at the time the registerContentHandler() or registerProtocolHandler() methods were invoked, and then navigate an appropriate browsing context to the resulting URL using the GET method (or equivalent for non-HTTP URLs). User agents should raise SECURITY_ERR exceptions if the methods are called with scheme or mimeType values that the UA deems to be "privileged". 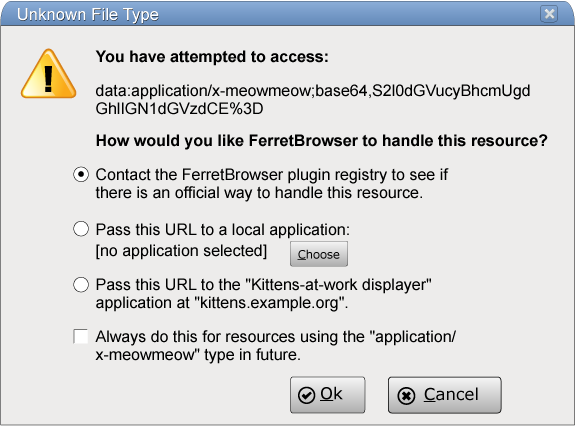 For example, a site attempting to register a handler for http URLs or text/html content in a Web browser would likely cause an exception to be raised. User agents must raise a SYNTAX_ERR exception if the url argument passed to one of these methods does not contain the exact literal string "%s", or if resolving the url argument with the first occurrence of the string "%s" removed, relative to the entry script's base URL, is not successful.